Sometimes I think to myself, how would I describe my personal style? It is always evolving, as am I. But the one thing I always go back to is - it's colorful. Living colorfully is what I aspire to do. And not just in the way that I dress, but, in the way that I am. Color to me is expressive; never dull or boring. The way I see it, life is just too beautiful to be monochromatic. This outfit is adorable Katie, you look beautiful! I love the bright colors and prints, I'm always too afraid to go too bold, but this look looks like something I might try! Love the mix of florals & brights here...and that jewel-collared blouse is just gorgeous!! This look is so cheerful! I love the print of the skirt! Great sparkle detail in the shirt too! Gorgeous! The detail on the collar of that shirt is so fun. I kick myself for not buying the dress in that print. It is gorgeous! Just simply stunning! The skirt is so beautiful! Absolutely stunning!! I love that skirt!! & your collar, oh my goodness!! Wish I could clone this outfit! LOVE each piece. The color is fabulous and just perfect for the beginnings of Spring! Amen sister! That's why I hardly ever dress in black. Life is too short to dress in black! Color is where it's at! I love the way you styled this look by bringing out all of the colors in your skirt with the top and cardigan! Happy Friday! you are flawless! such a beautiful girl! and I love love this entire outfit! Love this outfit. Reminds me of sunshine and we could use some right about now. love the tilda jcrew top!!! especially paired with all your bright colors!!!! You look amazing in bright colors. I love how you paired off your skirt with the sweater. Love this and love that attitude! I totally agree :) Happy Friday! I'm so glad your back! Living colorfully is definitely one of my life motto's! I love wearing bright bold colors, especially yellow, pink, and coral. I think that's why I'm so drawn to this outfit! It's happy and so so colorful. Love all your bright colors! You look gorgeous as always. you have great style! and color is great! love the outfit!! the skirt is gorgeous!! The colors in your skirt are gorgeous! These colors are all so gorgeous, and your skirt is the perfect statement piece! You are so pretty! I absolutely love this look! So jealous you got that top from JCrew! I have been admiring it for a few weeks, but just cant bring myself to spend the $$ on it. So stunning!! I hope to live a colorful life too and I should definitely think about starting with my clothes. Great outfit! colorful for sure!! i find my style is very colorful too. i love color. it really brightens up the day! This is such a fun bright outfit! love it! I love a wardrobe full of color! and your outfit is so happy and cheerful! That skirt is great! You look adorable! Im glad to see you looking happy and colorful. Its tough when life gets in the way sometimes. Just know even though its mostly just hair and fashion and a shared love of pink, I find your blog inspiring! And so you know you started a extensions contagion in me and my girlfriends. I must have shared your extensions post with 10 girls! We all have fake hair now and noone can tell! horray. keep up the amazing posts! I love the yellow cardigan and the print on your skirt! I have to agree, I love to live colourfully as well, and I think that's a great personal motto! Love the bright mix of colour in clothing and interiors! This ourtfit is so bright and cheery! Love it! Love your outfit. You look Stunning! The florals, the bright colors. You look fabulous! That skirt is gorgeous! Love it! I love all the light that's emanating from this outfit of yours! I've been wearing a lot of monochromatic outfits lately (I live in Seattle, it's been grey, I've been a little blue) so it's been okay, but I'm inspired to light it up again after seeing all these vivid colors! Love it! Just keep on smiling, thats the brightest shade of color you can find. I love wearing bright colors. You look gorgeous! I love the bright colors! Plus you can't go wrong with a classic black pump! Your smile is so beautiful and you are radiating in this post! So glad you are back, but completely understandable how life gets the best of us sometimes. Enjoy your time with your husband and sweet pups, life is too short!! 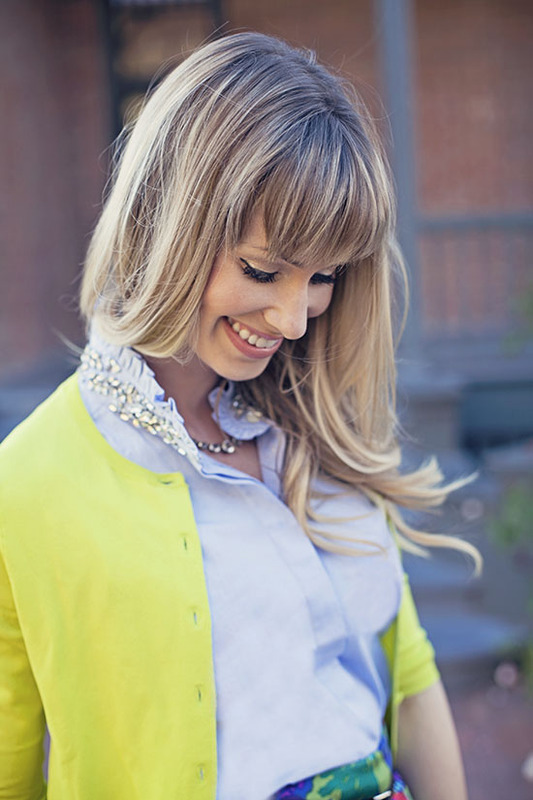 Love your thoughts on color and totally agree :) This outfit is adorable, and I love how springy and colorful it is! You always give the best advice, Katie! Absolutely love how positive you are. So glad you're back on the blog. All photos are so much stunning.